During the NBA offseason, teams have to assess their current roster situations to determine what moves are necessary — big and small — to improve their clubs in the short term and/or the long term. 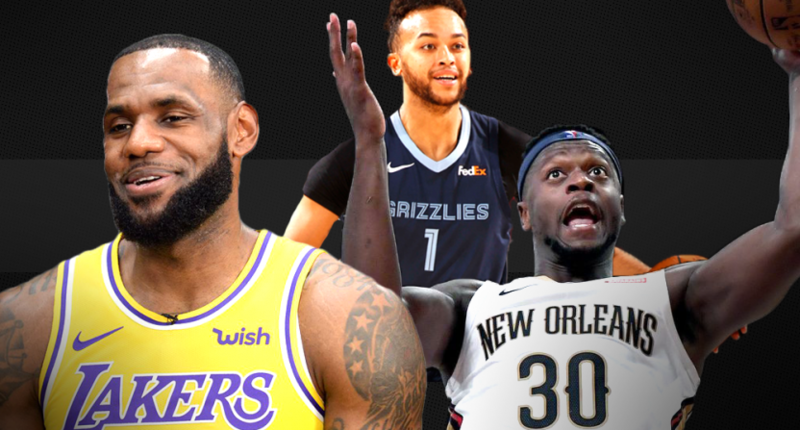 While some deals don’t work out, there were five moves — non-draft picks or re-signings — this summer that have paid off as we pass the halfway point of the NBA season. Putting James on this list is a no-brainer. LeBron is the single most important individual player to any NBA team. At 34, James is a human highlight reel who dominates on the court no matter who’s playing alongside him. He hasn’t taken a step back; he’s elevated his Lakers teammates and turned a lottery team into one of the most fun squads in the association. It’s the LeBron effect. In his first season with the Lakers, LeBron is averaging 27.3 points, 8.3 rebounds, 7.1 assists, and 1.3 steals per game. The Lakers have been in shambles since LeBron strained his left groin on Christmas. In 12 games this season with LeBron, L.A. has won just four times, with losses to Minnesota, New York, and to his former Cavs squad, the worst team in the NBA. The Lakers are 19-13 with him. L.A. better hope James isn’t hampered with injury for much longer, because the team’s playoff chances solely rest on his shoulders. Randle wanted a long-term commitment from L.A. after a career-year, and the Lakers balked, renouncing the former first-rounder, making available on the open market. L.A.’s loss was the Pelicans’ gain. The Pelicans got a bargain when they decided to bring in Randle to play alongside his fellow former Kentucky Wildcats teammate Anthony Davis. Randle profiled as a great fit. In L.A. he proved to be an effective scorer able to stretch the floor alongside Davis, while being a surprisingly good ballhandler for a big. Randle was arriving in New Orleans as an improved defender and an all-around better player. Thus far, Randle has fit in beautifully, averaging a career-best 19.9 points, along with 9.3 boards, and 2.9 assists in 42 games. Randle has elevated himself into the starting lineup and become a top-three scoring option on New Orleans (Jrue Holiday is averaging a touch above at 20.8 points), replacing the departed Boogie Cousins. Randle needed a change of scenery and New Orleans has been it. If the Pelicans could add better guard play some depth, they’d be much better than their 20-23 record suggests. Without question, the biggest trade of the offseason was the star-for-star Leonard-DeRozan megadeal between the Raptors and the Spurs. It was a shocking move. So far, both teams should be thoroughly happy with the move. While Kawhi Leonard’s sat out a handful of games (after sitting nearly the entire season in San Antonio) for rest purposes, the 27-year-old’s dynamic abilities on both sides of the court have been showcased in Toronto as he’s gotten healthier. In 2018-19, Leonard’s played at an MVP level. He’s averaged a career-best 27.5 points, along with 8.0 rebounds, 3.2 assists, and 1.9 steals, leading the Raptors to an NBA-best 33-12 record. Meanwhile, Danny Green has been as advertised, shooting more than 40 percent from the three while bringing a veteran edge on defense. Many people — myself included — assumed the Spurs got hosed in this deal. Halfway through the season, it’s clear they weren’t. General manager R.C. Buford and head coach Gregg Popovich have to be thrilled with their return. DeRozan has fit in with the Spurs, averaging a career-best 6.4 assists, along with 22.1 points and 6.2 rebounds per game, while shooting 46 percent from the floor. The 29-year-old’s still a rangy scorer, whose stellar craftiness and shot-making around the rim make him an elite scorer. DeRozan still checks out as a below-average defender, though, but the Spurs’ great defense hides his shortcomings well. The 23-year-old Poetl is a regular part of Popovich’s rotation. He’s not asked to do a lot, but he has great hands, can rebound, and is efficient. I’d still lean towards giving Toronto the edge on the blockbuster swap, but considering Leonard burned all bridges before getting sent to Canada, the fact the Spurs salvaged the situation into something positive is remarkable. Memphis took a small risk in signing the 6’9″ small forward nicknamed ‘Slow-Mo’ to their full mid-level exception. But so far, Anderson has fit in nicely to the Grizzlies’ grit-and-grind rebirth under coach J.B. Bickerstaff. Anderson hasn’t gotten any faster, but remains a plus defender who can protect the rim and swipe the ball from opponents with the best of them. Alongside power forward Jaren Jackson Jr., they form one of the most difficult defensive pairings to play against. Offensively, he’s never going to be great. However, he can handle the ball and is sneaky in the post. He’s averaging 7.9 points, 5.8 rebounds, 3.8 assists, and 1.3 steals per game in 41 appearances. Anderson isn’t exactly the most exciting player, but he does a lot of little things right and is a welcome addition to the Grizzlies’ starting lineup. Unfortunately, Anderson suffered a sprained ankle on Saturday and will be out at least two weeks. In that time the Grizzlies should realize how important Anderson is (if they haven’t already), even if he doesn’t stuff the stat sheet. Last season, the Milwaukee Bucks were without a high-impact center to pair alongside superstar Giannis Antetokounmpo, so it made sense the team signed Lopez to a one-year deal. Lopez’s odd evolution into a three-point marksman continued in Milwaukee. The 7’2″ center ranks 10th in the NBA in three-point makes with 106 in 42 games, after not regularly shooting them until his ninth NBA season. But he keeps making them, so why stop him? Lopez is averaging 2.5 made threes per game and is shooting 37 percent from beyond the arc. He’s also averaging 12.2 points, 3.9 rebounds, and 1.9 blocks. The 30-year-old is an incredibly poor rebounder given his size, but with Antetokounmpo basically capable of playing all five positions, Lopez naturally fits in beside his length. He stretches the floor for one of the NBA’s highest-volume three-point teams and gives the Bucks someone to rely on down the middle for a wicked cheap price. Lopez might provide the most bang for his Buck (pardon the pun) in the league.